“You are the salt of the earth.” “You are the light of the world.” These are the words that immediately follow the words we heard last Sunday – the Beatitudes. “He opened His mouth and taught them…” His teaching was not ‘teaching’ as in ‘instruction for how to be a disciple of his.’ “If you do this, then you will be my disciple and receive all the blessings that come with discipleship.” That’s the teaching of every other religion in the world. “If you do this you will be blessed.” First works, then if you’ve maintained at least a C+ average – blessing. But what Jesus teaches, in perfect harmony with whole bible because, after all, it’s all by Him and about Him, is unique. “Blessed are you…” and here are the works that follow. First blessing and grace and forgiveness and the Holy Spirit and a whole new life in Christ, then go be the person God has re-created in His image to be. So, there on the mountain, He put His blessing on them nine times. “Blessed are you…” By the power of His strong word alone, He brings them into the Kingdom of heaven where He rules as King of kings and Lord of lords and the good shepherd of His sheep. He had to put His blessing on them before they could be a blessing; just like He did with Adam and Eve in the beginning. “And God blessed them and said, ‘Be fruitful and multiply and fill the earth and subdue it.” (Gen.1:28) First He puts His blessing on them and then He sends them into the world. In Jesus day, salt was a basic commodity that was impossible to live without. Before refrigeration, salt was the only way to preserve food from spoiling. It was also important for basic first-aid to sterilize cuts and wounds. It bites and stings as it preserves and purifies. Jesus calls His disciples “the salt of the earth,” which sounds not quite right. Jesus Christ is the One who PRESERVES and PURIFIES the whole world with His body and blood. But as He puts His blessing onto them, they become ‘little Jesus’’ to the world. He is ABIDES WITH THEM and LIVE IN THEM. So as He sprinkles them onto His world and they will preach and teach and baptize and commune ‘the nations’ in His name, He is preserving and purifying the world through them. Everyone who listens to them is really hearing Him. Everyone whom they baptize is united to Him. Everyone whom they commune eats and drinks His very body and blood. This is the way that our Lord puts His blessing on US just as He did His disciples. And with His blessing, He sends US out into the world – “You are the salt of the earth.” Wherever the Lord sprinkles and scatters us, our home, our community, our factory, our classroom, our nation – we are the “salt of the earth” in that place. And so we shouldn’t be surprised or confused if a wounded and decaying world responds to our saltiness with, “Hey! That stings! That burns!” Remember what Jesus said, “Blessed are you when others revile you and persecute you and utter all kinds of evil against you falsely on my account. Rejoice and be glad for your reward is great in heaven, for so they persecuted the prophets who were before you.” (Mat. 5:11-12). The sting of salt sprinkled onto an open wound has the same feeling as the Law of God sprinkled onto the sinner. It stings those little cuts and scratches that you didn’t even know were there, and it burns those festering wounds that you thought would heal on their own over time. The Law makes us shout, ‘Hey, that stings!’ ‘That burns!’ And now we’re ready for soothing balm of the gospel – the good news that Jesus has fulfilled every “iota and dot” of the Law on our behalf and in our place and in Him there is forgiveness and new life and we are blessed. Since we’re all sinners who live in a wounded and decaying world, not a week goes by that we aren’t wounded by sin – someone else’s and our own. Not a week goes by that we aren’t cut by sin and infected and the deadly decay sets into us. We all need to have that preserving and purifying salt rubbed into our wounds regularly and repeatedly. 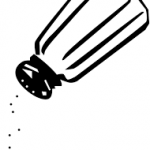 Which I think is how salt can lose its saltiness. Jesus warns, “But if salt has lost its taste, how shall its saltiness be restored? It is no longer good for anything except to be thrown out and trampled under people’s feet.” Disciples who themselves are not regularly salted lose their saltiness and are no longer good for anything in the Kingdom of heaven but to be thrown out and trampled under foot. It wasn’t until Adam and Eve brought sin into the world that the darkness started to “overcome the light” and refused to stay where it belonged. As He places His blessing on them, and through them on us, “His face shines on us” and we reflect His glory onto a dark and fallen world. We are a reflection of His light onto this world in a similar way as the moon reflects the light of the sun onto the earth. It’s not our light. It’s His. Sometimes we Lutherans are so afraid that our ‘good works’ might become the basis for our confidence before God that we treat them as though they were a bad thing. Not at all. Good works have their place and this is it – “BEFORE MEN.” We don’t do ‘good works’ before God so that He might see them and give glory to us. So, contrary to what we might have expected, Jesus DOESN’T say, that other will see your FAITH and “give glory to your Father who is in heaven.” ‘Faith’ is invisible to the human eye. Only God can see your ‘faith’. People can only see your works – YOUR GOOD ONES AND YOUR BAD ONES. They see your life and how you live it. They see what Sunday mornings mean to you and what’s important to you. You may not think they see it, but they do. If not now, they will. On the Last Day when Jesus appears in glory and every eye shall see Him, everyone will see all of the good works that all of His Christians did that they never saw or noticed. They never saw how God was sustaining and preserving the world through His Christians and the good works that they did in His Name. Let your righteousness exceed theirs as much as the good work that Jesus did exceeds yours. Your righteousness does not come from your good works at all but from the good work that Jesus Christ, the Light of the World did.